Did you know that I used Chrome Remote Desktop to publish last week’s Android customization post on remote desktop applications? It wasn’t the first time I’ve done that, and it won’t be the last. I hope you get the same value out of the apps. This week we are going to skip the Tasker and Android M topics we’ve been brainstorming for you, instead, I’ve heard from a few of you this past week alone asking about troubleshooting data usage on your devices. Let’s collectively answer a few of those concerns with a quick system check and general look at managing your data use and background services. The more seasoned Android user may consider this piece to be for the beginners in the crowd, and they are probably right. We are not looking at any fancy tools or techniques today, just running through the default system settings of your Android device. As mentioned, you do not need to install any apps today, just pick up your Android device and get ready to roll. We will be using our trusty stock Android 5.0+ Lollipop device, your experience may differ with manufacturer and carrier skins or older versions of Android, but we think the concepts are pretty standard, you should be able to mostly follow along. 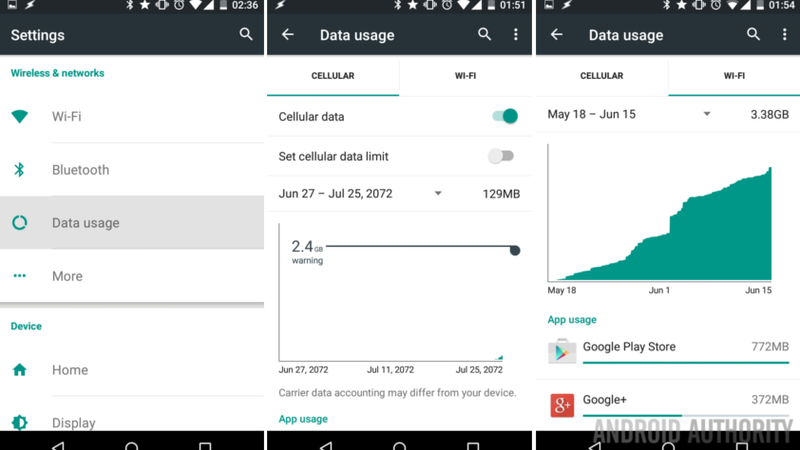 Android comes with a built-in data usage tracker that is able to keep tabs on your cellular and WiFi total usage, as well as usage for individual apps. Although this tool is quite consistent and effective, please consider your carrier’s data tracking tools to be king for your cellular usage, we don’t want you going over your limit because Android failed to properly track something. Head into your system Settings. From here, poke around to find the option to swap between Cellular and WiFi data counts, turn on or off your cellular data and WiFi and more. You’ll see a graph of your current month’s usage with a drop down to see previous months usage amounts. Finally, scroll down to see a list of all of the apps that have connected to the internet on your device. Tap an app to see a detailed view of its data usage and turn off its ability to use data in the background. If you are experiencing an app that is eating up your data in the background, which also eats up your battery, you can turn off background data for each individual app, as noted above. But if there is just too much going on, you can also turn off all background data. From within Settings -> Data Usage, tap on the menu button in the top right corner, then tap Restrict background data. And when things get really bad, you can come back to completely turn off cellular data. This is a little bit less restrictive than turning on Airplane mode, but can also be accessed from the quick settings section of your notification shade. This is a controversial one. Google enables the setting Scanning always available by default because it enhances your user experience. While this is true, it also allows apps to eat up WiFi and battery, even when WiFi is turned off. Turning this setting off may not save you much actual data, but some report that it has saved them significant amounts of battery drain. We recommend you play with this setting independent of the rest of the changes you make today, so that you can evaluate if turning it off has actually helped you. From the main system Settings, head into Wi-Fi. Tap the three dots menu button in the top right. You’ll also see the options to turn off notifications for public access points and WiFi usage while the device is sleeping and more. Last thing today, you will find that much of your data usage is from apps and services that sync in the background. This goes especially for Google services, but many other apps also have controllable sync settings from within Android settings. You see now what apps and services have sync controls. Don’t forget to check these and other apps for sync settings within app as well. I recommend clearing the others first, leave Google for last. Again, you want to be choosy here, apps and services that you use frequently, or enjoy receiving notifications from, will need to stay turned on. You can see that I turn off Humble Bundle sync, nothing against them, I actually own almost every mobile bundle, but I simply do not access the app frequently enough to require constant syncing. When you tap into the Google section, you will see all of the accounts that you have logged into the device, and the last time they reached out to Google servers to sync. Tap on your account (email address) to see a detailed list of services. Toggle on and off the service you wish to have constantly updated. You notice that I have my Android Authority account logged in, but I only have one Google service syncing, Gmail. All of the other Google services I want with me on this device and actively syncing are tied to my personal account(s). Each of my devices is configured slightly different based on the services that I use them for, but my general rule for my gear is that if I’m not using it, I don’t sync it. Well, there you have the three biggest data usage controls on your Android device. Take some time to get to know your device and needs, play with the available settings. There is some trial and error ahead of you as you figure out which items to turn off and which you must keep turned on to keep your device operating properly. 1. The many services across Android will sometimes report data use under unexpected apps. For example, the very first time I pinned and downloaded music to Google Play Music on my tablet, most of the collection reported data under Play Music, but a large amount appeared to have reported under Google Services and a little under both Android OS and Media. I’ve seen this type of random distribution for data that should have landed under Removed apps and users as well. 2. Android Share menu. There are times when you will take action on your device, perhaps sending pictures to a friend or downloading a file from your cloud storage solutions. Depending on your situation, it is possible that the data usage will report under the app you started with, the app you shared to, or both. We need an example here, the new Google Photos will work – As you view photos that are stored in your Google+ Photo storage, Photos will use the data to download and view, but if you then share some of those photos over G+, will Google+ then report the data use, or will Google Photos? I haven’t actually tested this, but I hope you get the idea. 3. Uninstalled apps. Admitting that there is a dedicated data usage entry called Removed apps and users, I do not trust that all data is properly reported here. Once again, I suspect at least some data use from uninstalled apps reports elsewhere. So, what do we do about all of this data reporting leakage? Feel free to discuss in the comments below, I will eventually revisit this with some suggestions, but it might be a while before I get to it, sorry. In the end, the numbers do add up to report your total data usage with some accuracy, regardless which app it reports as using your data. Please remember that we kept it very simple here today, there are apps and custom ROMs that focus on reporting and controlling your data much better than the built-in Android tools. Perhaps we’ll visit those around here one day as well. I hope today’s Android customization post has empowered you to take and keep control of your data services and usage. Next week is another grab bag, there is still one particular feature in the recently updated Tasker that I want to share with you, just as there are tons of great new features in Android M.
What do you say, any really weird data usage reports in your device, like, is anyone else getting usage numbers for 60 years into the future and can help me fix that?